adidas Tennis joined the movement to end marine plastic pollution with the release of the first-ever Parley tennis collection made from Ocean Plastic®. The world’s top tennis players, including Alexander “Sascha” Zverev, Caroline Wozniacki, Angelique Kerber, Jelena Ostapenko, Garbine Muguruza, Lucas Pouille, Dominic Thiem, and Jo-Wilfired Tsgona are taking a stand and putting the new gear to the test in the 2019 Australian Open. The collection is designed to protect the oceans through eco-innovation, but the message and vision looks far beyond sportswear. The new collection — and partnership behind it — aims to create change and inspire the industry, athletes, spectators and fans to better protect the planet and its life-giving ecosystem. To launch the collection and raise awareness for marine plastic pollution, adidas Creators and professional athletes united on January 10 in Sydney to Play for the Oceans ahead of the official tournament. 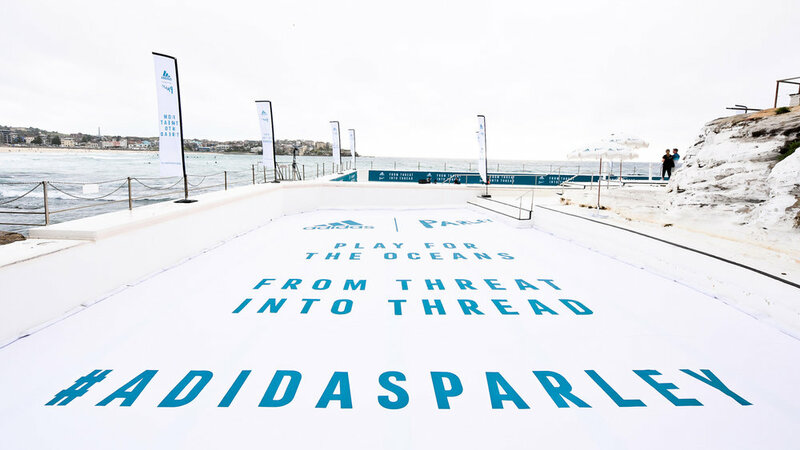 Together with adidas, we transformed the iconic Bondi Icebergs Pool into a seaside tennis court. After the games, the court was disassembled and donated to a local school for continued use. Participants included: former tennis champion Ana Ivanovic, former Olympic swimmer Ian Thorpe, cricket player Ellyse Perry, football player Josh Mansour, dancer Mimi Elashiry, former rugby players Beau Ryan and Daniel Conn, and model Jesinta Franklin. The event was a celebration of the oceans and a call to action to participate in their protection through the Parley AIR Strategy: Avoid, Intercept, Redesign. The world’s leading tennis athletes took the movement from the coast to the courts, transforming the 2019 Australian Open in Melbourne into a campaign for the oceans. Sascha Zverev, Caroline Wozniacki, Stefanos Tsitsipas, Angelique Kerber, Jelena Ostapenko, Garbine Muguruza, Lucas Pouille, Dominic Thiem, and Jo-Wilfried Tsgona are playing for the oceans wearing the new adidas Tennis x Parley collection made from Ocean Plastic®. The tournament continues through January 27.